...what/who the hell IS Bunnyken, anyway?? I can't tell you how many times I've had to tell the story behind Bunnyken, so I decided to write up this page to help explain its mysterious origins. Simply put: Bunnyken is a half bunny, half chicken creature -- hence its name. ​Although I often refer to it as "he," it is of indeterminate gender. But the mythos of Bunnyken cannot be explained that easily. Not by a long shot. It all began well over a decade ago, when I came across a very strange item for sale while searching "weird auctions" on Ebay just for the hell of it: It was listed as Bunnyken. ​It appeared to be some sort of weird doll, with, sure enough, the word BUNNYKEN embossed on the back of its head. It was so baffling, funny, creepy and odd that I saved the pictures of it. I, along with my friends Arahan Claveau and CickMyLunt (who was eventually forced to change her avatar's name to "CensoredMy Lunt" at the insistence of SL's ridiculous policies), had been asked to DJ an in-world event for W-hat's Third Birthday celebration (April 27, 2007). ​Below is a mosaic of the W-Hat event. Arahan (left, dressed as the infamous SL user Prokofy Neva) and me getting ready for the big party! 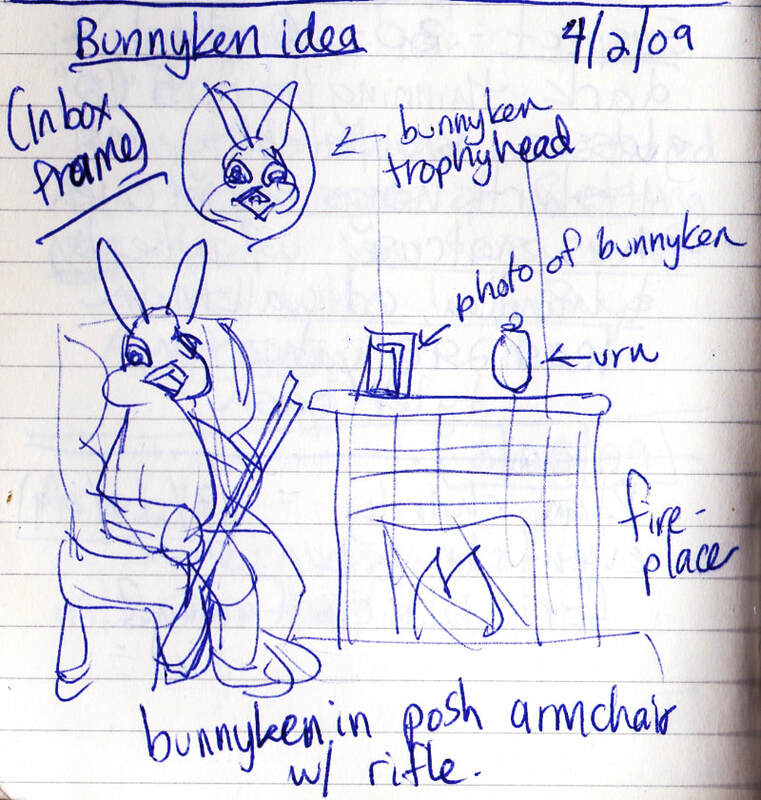 The above picture shows the first incarnation of the Bunnyken avatar. I later improved it with better texturing, etc. Bunnykenball was/is a floating sphere with a moving psychedelic pattern and a Bunnyken figure slowly rotating inside of it. Creating the Bunnyken avatar only fueled my renewed obsession with the character. In Second Life, I began to make various Bunnyken virtual sculptures. The first significant one was titled Bunnykenball, circa 2008, which I created for the virtual gallery space at the now-defunct mixed-reality space, Brooklyn Is Watching**, which held weekly podcasts at a real-life gallery location to discuss the artworks set up at the SL location. Sadly, Brooklyn is Watching came to an end in 2010, but screenshots and images from the SL location can be found on their Flickr page. ** "Brooklyn is Watching was a hybrid SL/RL project that existed in Second Life. We were at Jack the Pelican Presents (487 Driggs Ave, Brooklyn, NY 11211, USA) where gallery visitors had been able to see and interact with anything that happened at the sim via the 52 inch monitor." "'Brooklyn is Watching' [was] a project sponsored by Popcha, a New York based media technology company, and [it took] place simultaneously at the [now defunct] art gallery Jack the Pelican Presents in Brooklyn, New York and in Second Life. A performance space and presentation/sandbox in Second Life [were] set up for this. An avatar, in the shape of an eyeball and under the name Monet Destiny [viewed] and [projected] the goings-on there at all times onto a large screen monitor at the Real Life gallery." For the next several years, Bunnyken returned time and time again to my SL artwork, often in collaboration with my friend and fellow artist, Arahan Claveau. He and I collectively owned and ran an artspace/partnership in SL called ArthOle that opened in April of 2008; it consisted of a virtual gallery space, performance art venue, and music events, all of which occurred in SL, including the somewhat infamous ORIENTATION interactive theater event. ​ORIENTATION was a multimedia promenade performance incorporating audience participation. The first performance of ORIENTATION was a cross-reality event in 2008. It was broadcast simultaneously to a real-life cinema in Amsterdam for art collective PLANETART's event, PICNIC08 and was also experienced live via Second Life in-world virtual video screens. Attendees who were invited to participate in ORIENTATION event logged into Second Life from various locations around the world. They would then teleport their avatars to the event location, change into Bunnyken avatars, and follow directions from the actors (ORIENTATION employees, played by SL users Arahan Claveau, Dekka Raymaker, Penumbra Carter, and me). Due to the nature of the performance, numbers were limited to 10 guests per performance. ArthOle reformed temporarily for the 2011 Odyssey Performance Art Festival to host a remixed performance of ORIENTATION. The video documentations of ORIENTATION were filmed in Second Life in the Virtual Holland region by Chantal Harvey. One of my Bunnyken-related SL installations, Autosarcophagy, received a brief moment of virtual hype/notoriety when it was selected to appear in the Second Life Showcase, a listing of notable and interesting destinations, circa June 2010. My original concept sketch for Autosarcophagy -- the idea for this came to me in a dream. "When you first step inside the latest art exhibit at Numinous, you're greeted by a giant chicken holding a shotgun with a chicken-skin rug lying on the floor. Man, that just ain't right. Follow the blood-stained footprints around back or click on one of the build's many interactive elements and things really get weird." But... wait, this one looks... different. It appears that this is actually Bunnyken in its original form. The one in the yellow suit must have been someone else's genius creation -- a Bunnyken head on a decapitated doll body. I asked the sellers if they knew ANYTHING about Bunnyken's background -- what year(s) it was made, where it was manufactured, anything -- but they had no idea, either; they'd brought this Bunnyken to Antiques Roadshow, and even the appraiser had no idea what the hell it was. "It reads BUNNYKEN on the bottom so I am assuming that is who made it. I took it to the Antiques Roadshow, they had never seen or heard of one before and thought it was pretty rare and very different than anything they had seen. They apprised (sic) it between $75 and $100...."
...I EVEN FOUND ANOTHER BUNNYKEN WITH A DOLL BODY. What are the chances that TWO people had the idea to make a weirdo doll like this?? Amazing. This one didn't have an outfit, though - it was completely naked. 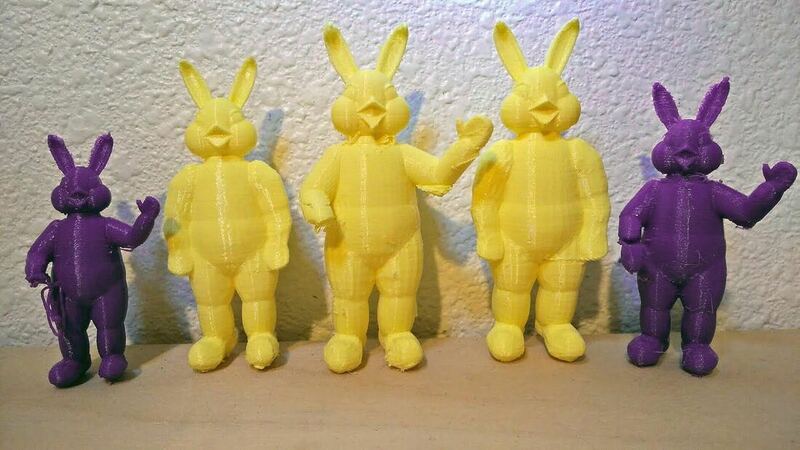 ​I eventually plan on making a yellow suit for it, as close to the "original" Bunnyken as possible. For now, since I have zero sewing skills, an old decommissioned sock will have to do. ​Over the years, my research (Googling) has uncovered a few facts about Bunnyken. It appears that it was a short-lived toy designed as an Easter candy dispenser -- so one of my hunches about Bunnyken turned out to be correct. I also found out that it was manufactured for a brief time in the late 1950s in Midland, TX, USA by an enterprising person named T. R. Ewart, who apparently named this business Bunnyken Inc.
Production and sale of the Bunnyken were commenced in 1958 but due to certain mechanical defects the venture was abandoned in 1959." Sadly, I have found no information at all (so far) about the artist who was commissioned to design the Bunnyken toy. I also found an couple of old newspaper clippings advertising Bunnyken for sale. Here's one posted in an ad for a now-defunct department store in San Antonio, TX, called Joske's. Below is another mention of Bunnyken in the Pittsburg Post-Gazette, 19 March 1959. Part rabbit and part chick is this fortune-telling addition to the Easter toy list. You have to see it to believe it. The Bunny-Ken has a bunny's head and a clear plastic neck inside of which you can see a row of edible jelly bean eggs. Its body has the shape of a chicken. It stands on chicken feet attached to a round platter indented in miniature egg shapes. ​ Turn a handle in its chest and the Bunny-Ken lays a jelly egg. Then you read the 'fortune' written above the groove the egg rolls into. Pay $2.95 for one at Gimbels candy counter. Packages of right-sized refills are 20 cents each. " 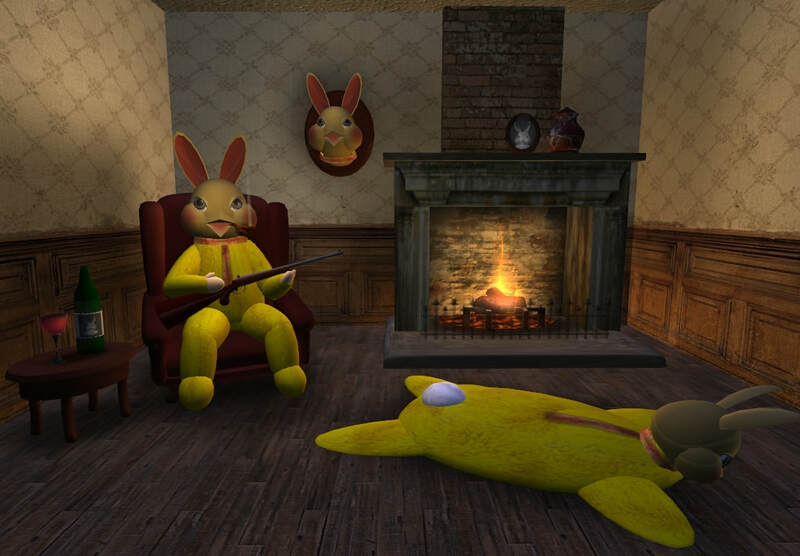 Bunnyken has continued to inspire my art-making process, in and outside of Second Life. In my junior and senior years at Evergreen State College (Olympia, WA, USA), I have returned to Bunnyken as a motif in various art projects I have been doing, including my experiments in learning 3D modeling and beginner VR development. In Maya, I built a very basic (Bunnyken mesh model, which I then printed using an old Makerbot on campus. In Unity 3D, I learned how to develop and export a very basic Google Cardboard VR app, which is essentially just a 360 non-interactive environment. I used the model of Bunnyken I created in Maya to add to the scene. So what lies ahead for Bunnyken and me? "The main avatar [Nebulosus, seen at left] that I have used in this work is a representation of my digital body and portrays the concept of my essential self. Through this exploration of my identity, I have been able to reconcile crucial aspects of myself that I have been at odds with during the course of my life. ​My avatar appears in this performance as an evolving form, beginning as my “true” avatar and slowly morphing into the Bunnyken figure—which is in a sense my avatar’s avatar. 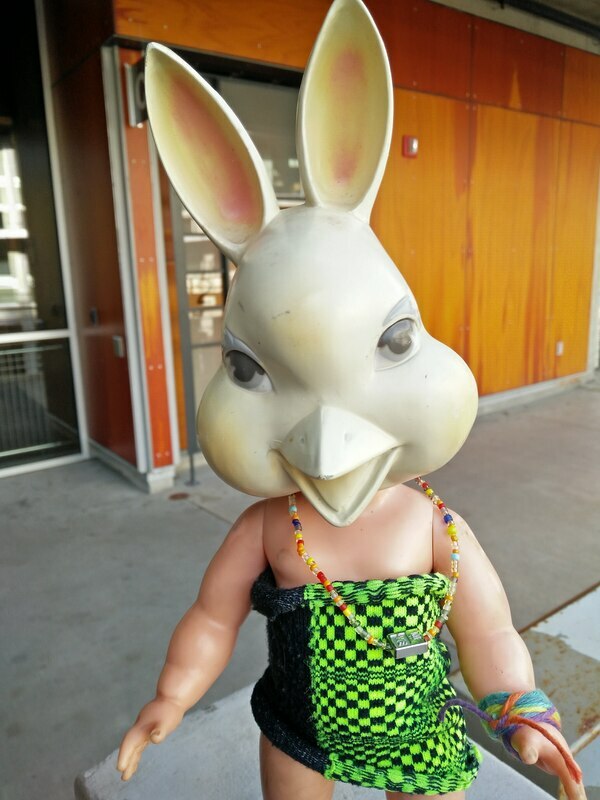 The Bunnyken figure is meant to represent an enigmatic “everyperson” with unidentifiable gender and ambiguous expressions. In the context of this project, the avatar is a metaphor for questioning and examining identity: in relationship to the self and to others “outside” of the self; one’s identity in context with others; and of losing one’s individual identity to merge with an interconnected, collective consciousness." At the end of the aforementioned performance, my avatar went to a location in Second Life that I had previously invited other Second Life users to; all the volunteers were wearing Bunnyken avatars as a representation of group/interconnected identities. "Don't talk to me or my spawn ever again"
STAY TUNED FOR MORE WEIRD BUNNYKEN ART!